Former Doncaster Knights back Connor Braid has been handed a three-month contract by Glasgow Warriors to prove he is worth a longer-term deal. 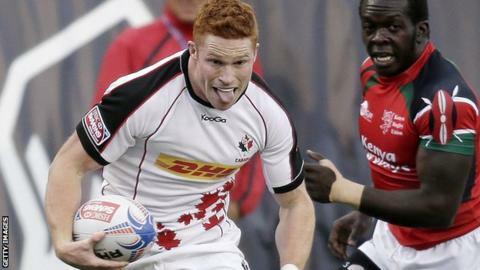 The 24-year-old is a Canada international and was in their sevens side for the Commonwealth Games. Warriors head coach Gregor Townsend said: "We're looking forward to getting the chance to look at Connor in training and in matches. "He has a real desire to develop as a professional rugby player." Braid, who can play at fly-half, centre and full-back, has played for his country 12 times at full international level. "His versatility will come in useful and he'll add to the competition we already have within the squad," added Townsend. "Connor should be in good physical shape having been involved with the Canada 7s team at the Commonwealth Games, so he's likely to be involved in our pre-season games over the next couple of weeks." Braid, who scored a try in Canada 21-5 defeat by Scotland at Ibrox during Glasgow 2014, has started training with his new team-mates ahead of Saturday's friendly against Harlequins. He joins countryman DTH van der Merwe at Scotstoun and says his close friend spoke very highly of the Pro12 club. "Glasgow is a really good club and, when Gregor gave me a call, I jumped at the opportunity," said Braid. "I've been playing with Canada 7s recently, but I felt this was a great opportunity and couldn't say no. "I'm here for three months and I'll keep my head down and work hard as I'd love to be here longer." Braid becomes Glasgow's fourth new signing this week. Winger Lee Jones and fly-half Gregor Hunter were both previously with Edinburgh, while flanker Will Brodill with Sale Sharks.